Lightstreamer will be an exhibitor at 2009 SIFMA's Technology Management Conference & Exhibit, the premiere financial services technology event. Come and visit our booth to ask any questions on Lightstreamer technology and see some demonstrations of our products. I just tested version 0.9 of Ozone, a new browser for Symbian phones. It is based on the WebKit engine and seems to be very fast and compliant to standards. With Mozilla Prism you can package a web application as a desktop application. You can launch it from a desktop icon and have a browser process dedicated to the application, so that it runs in full isolation. GroovyDB is an appliance made by GroovyChannel that provides "SQL Virtualization" technology. It will be offered as a hosted "Cloud" service too. They recently added Web Push capabilities, so that any changes to the data are reflected in real time through a Web front-end. 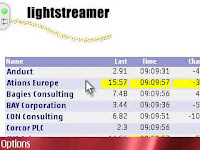 The Comet Server used by GroovyDB is Lightstreamer. Their site hosts a live demo of news pushed in real-time from the GroovyDB. The Lightstreamer Adapter code they developed is available for download.